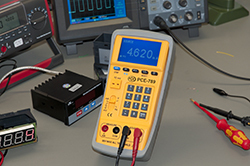 The PCE-789 Multifunction Calibrator is a versatile instrument for measuring and simulating process signals. It measures and simulates current and voltage signals. The curves of different types of thermocouples are stored on your computer, and because of this you can introduce and display the values in °C. 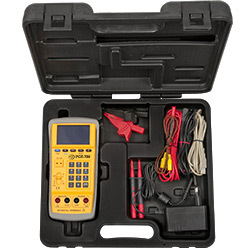 The main feature of this multifunction calibrator is the integrated function generator. Apart from the waveforms of sine, triangle and rectangle, the multifunction calibrator has stored 10 sinusoidal waveforms. Using the software, which is included in the delivery, you can create specific waveforms and store them in the multifunction calibrator. Furthermore, this multifunction calibrator can give two overlapping frequencies. For its functionality combined with a robust plastic housing, the multifunction calibrator can be used in many scenarios. 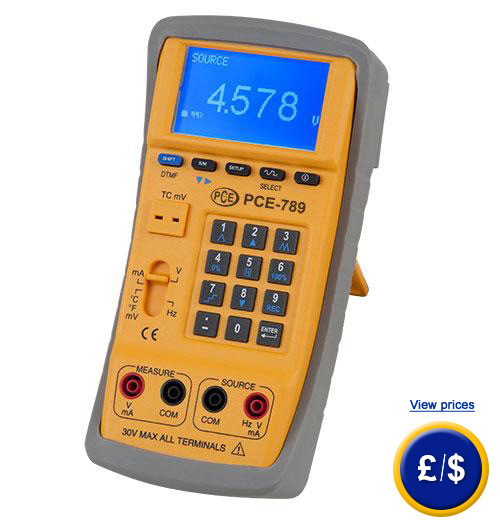 This multifunction calibrator is a useful tool which can perform many tasks in areas such as maintenance in the industry, furthermore it can be used by engineers and laboratory technicians in the service sector. This system is supplied by mains adapter and battery allowing mobile use. If you have any questions about the multifunction calibrator, see the following technical data or contact us: UK customers +44(0) 23 809 870 30 / US customers +1-410-387-7703. Our engineers and technicians will be happy to help you with the multifunction calibrator, and of course, with other products in the field of regulation and control, measuring instruments and scales or balances. The PCE-789 Multifunction Calibrator is delivered in a hard case to carry the multifunction calibrator and all additional components. In addition to measuring points and alligator clips, a test adapter for connection of thermocouples is also included. Other components of the delivery are the USB cable for PC connection and a mains adapter for continuous operation. This reassures you can work on a comfortable location and on site. The multifunction caibrator is operated with the keyboard. The graphic display shows all relevant data. The multifunction calibrator is primarily used for two purposes. 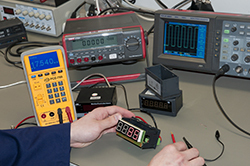 On one hand, you can make precise measurements of current and voltage. This feature allows you to check signal transducers that emit a standard signal. For example, while charging a pressure transducer with a known pressure, or while the multifunction calibrator measures the current delivered to the transducer. The opposite function is the simulation of currents and voltages. This function of the multifunction calibrator provides a quick test of devices for evaluation. Digital indicators, recorders or controllers can be charged/energised with currents and voltages and thus verified in their performance and accuracy. The multifunction generator integrated into the multifunction calibrator offers a variety of other uses for this versatile instrument. who wish to integrate the multifunction calibrator in their internal quality control or for annual recalibration). laboratory calibration certificate which includes all measurement values.